Clearwater Beach, the Best Beach in the United States (and the 6th Best Beach in the world! 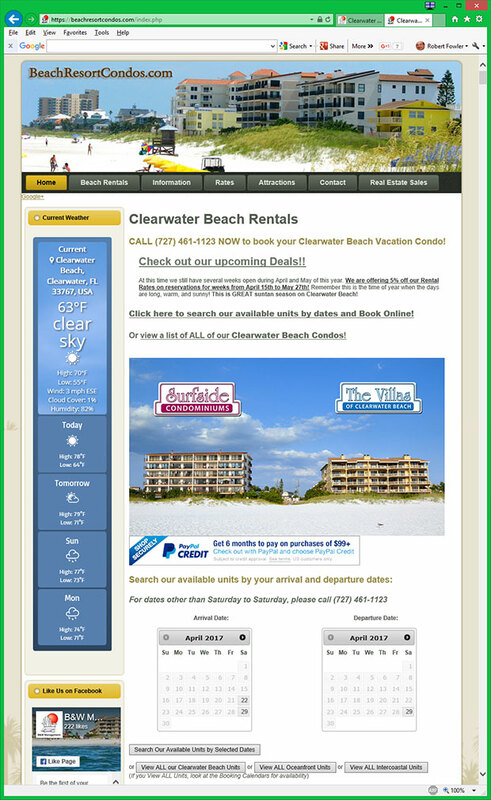 ), is known for its soft white sand beaches. The sand, as soft as sugar, makes the perfect environment for walking on the beach, lounging in the warm sun and building sandcastles! These three items, or similar items, are needed. The bucket will be used for moving both water and sand. If you have an option to bring more than one bucket, do so. Variable sizes of the buckets may also be helpful. A shovel will be needed to dig and pack sand. A small shovel is okay, but if you are building a very large sandcastle you’ll be able to save time with a large shovel. An offset spatula can be replaced with many other small items. It will be used to help trim, smooth and add decorated detail to the sand castle. If you have other tools that may be helpful, bring them with you. If you’re just getting started with building sandcastles, the classic sandcastle buckets can be a great starting place to quickly build small, fun, sandcastles like the picture above. The first thing you need to do is to select a location and build a strong foundation for the sandcastle. You’ll want to be near the water. This will provide shorter trips for water and more dense sand to build on. Be careful not to build too close to the water that a larger wave could wash away your structure before it’s even finished! You may also want to keep an eye on when the tides are shifting. 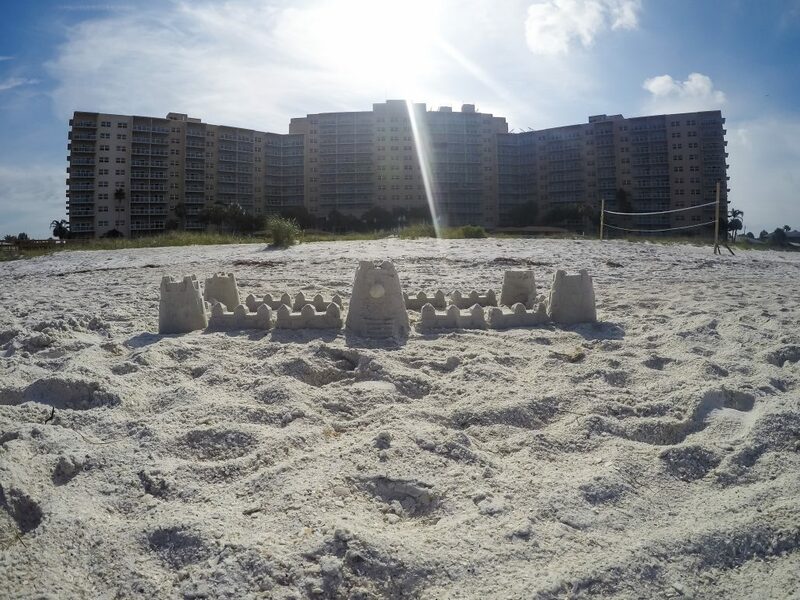 A rising tide may quickly bring those waves closer and closer to your sandcastle. Once you have a location chosen, start digging a large circle. It will serve as a backup moat to protect the castle from any surprise waves. The sand removed should be tossed into a large pile in the center of the circle. Once you have a large pile of sand in the center of the circle, you’ll turn the pile into a volcano shape. Pack the sand together tightly with an edged crater at the top. Slowly pour water into the crater and wait for it to drain down through the pile of sand. Patting the “volcano” on all sides, including through the water on the top, to form a dense sand base. 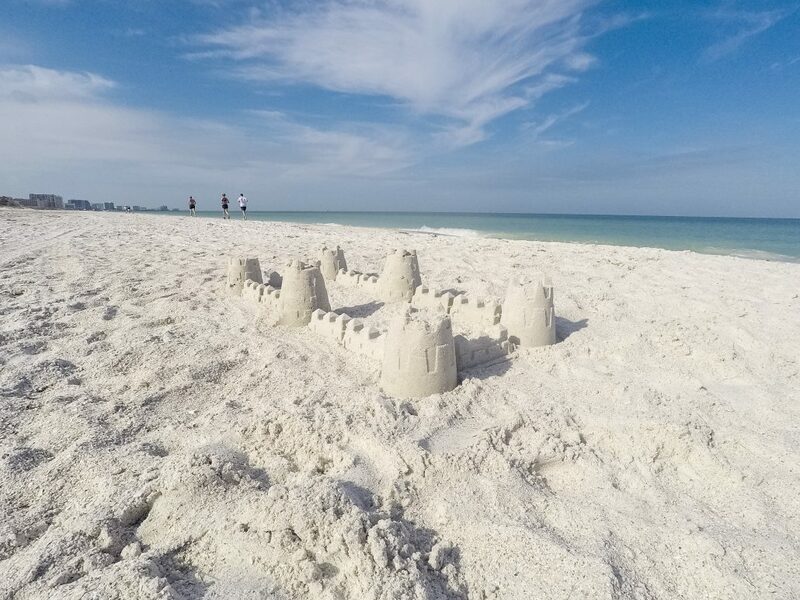 With the base formed, it’s time to start building the overall structure of your sandcastle. Grab your bucket and fill it almost full of water. Then start adding sand to the bucket of water. You always want to add sand to water, not water to sand. Adding sand to water puts you in control of the density needed. As you add more sand, the water will start flowing over the top of the bucket and that is fine. Continue adding sand. As you add sand, lightly shake and the bucket and tap on the sides of the bucket. This will force any air bubbles out and help improve the density of the sand. Once the bucket is full of dense wet sand, flip it over and position it on the foundation. Let sit for a few moments and then slowly pull the bucket away. If you’re adding multiple layers of foundations. Use the largest buckets at the bottom and then smaller bucket ontop of the large bucket. If you only have one bucket. Put two or more “towers” right next to each other. Then add in sloppy wet sand by hand in between the towers, connecting them. Then add another bucket ontop of these to form another layer. Begin carving your design into the structure. Removing large amounts first and moving from the top down. Then begin adding in more features including designs from the top down. Start with a roof, then walls, and finish with the base. Then do the same process again focusing on smaller details each time you move from the top to the bottom so the sand does not fill in small areas below it as you work. The last step is to clean any major errors. Cleaning major messes and leaving some small design mistakes can help it look like it is made of stone and has a few cracks. Continue moving from the top down, leaving flaws is okay but down leave large piles of soft sand where they don’t belong. Look at the base of the sandcastle and make any adjustments there as well. One way to finish the sandcastle is to flatten the surrounding area and then lightly dust the area with soft sand. Have fun! Mistakes happen, take your time and enjoy the beautiful day. As a VERY amateur sandcastle creator, these are the best tips I can give you. 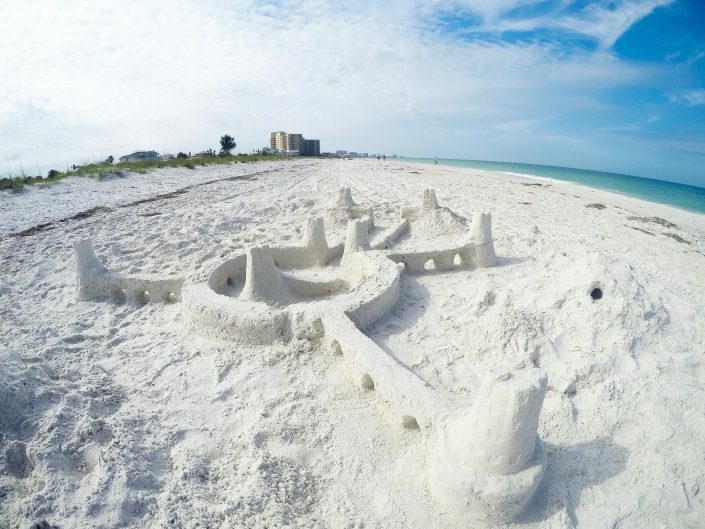 If you happen to be in Clearwater Beach in April, check out all the amazing, large and professional sand castles and sculptures at The Sugar Sand Festival located at Pier 60. Pier 60’s Sugar Sand Festival includes a 21,000 square foot event space on the beach filled with sand castles and sculptures. 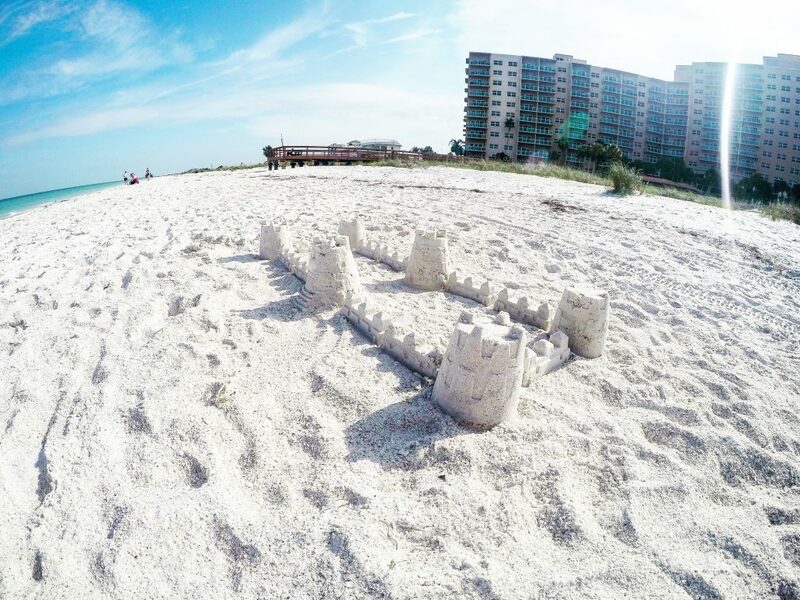 The celebration of Clearwater Beach’s soft sand continues outside the event space with live music, fireworks, kid’s play zones, sand sculpting classes and more! If you have any tips for building sandcastles, please leave them in a comment below!